As we continue to see headlines and editorials almost every day about migrants and refugees, it's not surprising when UNHCR reports that the number of forcibly displaced people has reached 60 million worldwide for the first time since World War II. This figure includes internally displaced people, refugees, and asylum seekers. While many are on the move as refugees, others migrate willfully at rates that have also reached unprecedented levels. Below, I've explored some trends in regional, country- and economic-level migration and refugee data. But first: What's the difference between a migrant and a refugee? According to UNHCR, a refugee is any person who has been forced to flee their country of origin because of a fear of persecution. A migrant, on the other hand, is one who leaves their country voluntarily for reasons such as employment, study, or family reunification. A migrant is still protected by their own government while abroad, while a refugee lacks protection from their country of origin. The latest data show that the top countries of origin for refugees in 2014 were typically countries classified as fragile states by the World Bank Group. In many of these countries, poverty alleviation and disease eradication are even more challenging. Syria and Afghanistan top the list of refugee countries of origin with 3.9 and 2.6 million refugees, respectively. Of the top ten countries of origin, only two—Pakistan and Vietnam—are not classified as fragile states. Africa and the Middle East are the top regions of origin for refugees. In 2014, 4.5 million refugees came from the Middle East and North Africa, while 4.4 million came from Sub-Saharan Africa. Latin America and the Caribbean had the lowest number of originating refugees, with slightly over 200,000. Where are refugees finding asylum? The top asylum countries for refugees are also typically developing economies from the Middle East, Africa, and South Asia. Jordan housed the most refugees in 2014 with 2.8 million—more than a third of the country's total population. 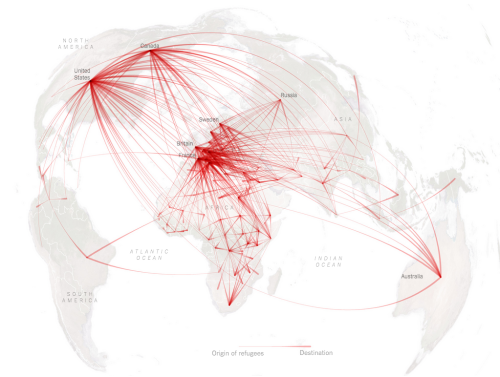 Looking at the big picture, the data visualization from the New York Times below shows that refugees are truly spanning the globe. When we take a closer look at the data, it shows that the majority of refugees find asylum in countries close to their country of origin. And while the news shows a steady stream of refugees trying to reach Europe, the region grants asylum to comparatively few—about 3 million. By comparison, the Middle East and North Africa hold 7.7 million asylum seekers, and Sub-Saharan Africa has about 3.6 million. It's not only refugees who are crossing borders—in an increasingly interconnected world, migration as a whole continues to increase. Below, I use the indicator Net migration to chart the highest emigration flows by country. Net migration is the total immigrants minus the annual number of emigrants. Unlike the flow of refugees seeking asylum—which shows a trend of migration within developing countries—the flow of migration as a whole shows high income countries like the United States, Canada, and Russia receiving the highest inflows of immigrants. Meanwhile, developing countries, especially from South Asia, send out the highest numbers of emigrants. High income countries show a positive trend of immigration, while low and middle income countries show an increase in emigration over recent years. As the political conflict and economic hardship grip much of the developing world, it's necessary to keep an eye on the patterns and flows of migrants. This task can be especially difficult when faced with undocumented migrants, which often go under the radar. If you're looking for more statistics on the topic, the UNHCR has extensive data on refugees and population. Please also take a look at the World Development Indicators online tables as well as the World Bank Group's Migration and Remittances web site.